when they poison the bogs we will still braid sweetgrass. Installation result of a land-based endurance performance. Meagan Musseau, 2017. PEJIPUK | the winter is coming is an exhibition by Meagan Musseau acknowledging the inherent and intuitive connections to Ktaqmkuk, the island now called Newfoundland. This exhibition integrates Indigenous art practice with contemporary techniques to reclaim Mi’kmaq and Beothuk cultural belongings and place names. Musseau works in opposition to colonialism and the cultural erasure of the traditional people of Ktaqmkuk. Her artistic practice is comprised of research, community involvement, and actions between herself, land, and story objects. 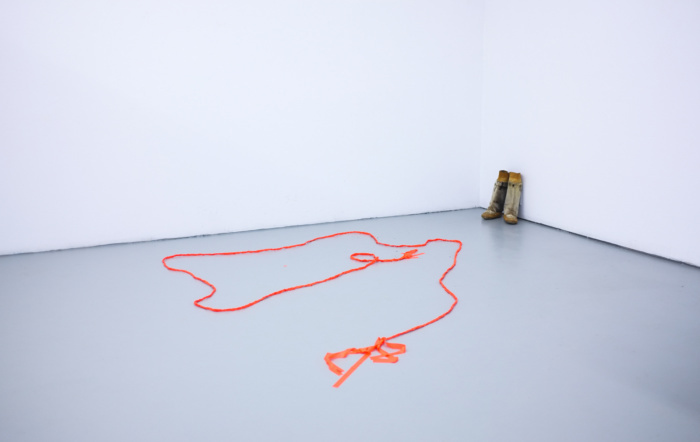 Musseau aims to create objects that are embedded with narrative to gain a deep rooted understanding of the water and the land of her ancestral territory. She produces these objects using the labor intensive processes of beadwork, basket weaving, embroidery, and hand sewing seal skin and moose hide. In a series of baskets, Musseau replaces the traditional materials for Mi’kmaq basketry, ash wood and sweetgrass, with synthetic vinyl and flagging tape. Utilizing these materials, she emphasizes limited access to resources and works to practice resilience and adaptive technology. Interweaving these techniques with new media, Musseau activates material through land-based installations which seek to acknowledge Indigenous territory through performative action. This exhibition is a continuation of Musseau’s Inter-Arts project titled we are not landless, funded by Canada Council for the Arts. A series of works for PEJIPUK | the winter is coming were produced during the Inherent Design artist residency at Banff Centre for Arts and Creativity. Meagan Musseau is an interdisciplinary visual artist of Mi’kmaq, French and Irish ancestry from the community of Curling in the Bay of Islands, Newfoundland and Labrador––Elamstukwek, Ktaqmkuk territory of Mi’kma’ki. Musseau has a BFA in Visual Art from Grenfell Memorial University of Newfoundland and Labrador. 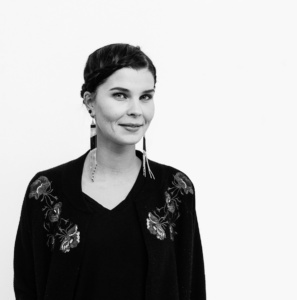 She is a member of the Indigenous Artist Collective on Lekwungen territory (Victoria, BC) and the Atlantic Canadian representative for the National Indigenous Media Arts Coalition (NIMAC). Meagan received a 2016 Aboriginal Arts Development Award from the First Peoples’ Cultural Council and her work was recently featured in “Constellations: bonds, ties and networks in 10 emerging practices” by Erin Sutherland for Canadian Art, Summer 2017. Eastern Edge would like to further acknowledge the generous support provided by, Flotilla and The Averbach Foundation.